As you traverse the icy wastes of Hoth in the Return to Hoth expansion for Imperial Assault, you can bring the spotlight to some of the game’s iconic characters with four new figure packs. Each of these expansions offers sculpted plastic figures to replace the tokens found in the Return to Hoth expansion, alongside new cards and missions to supplement your campaigns and skirmishes. Journey out onto the freezing plains of Hoth and decide the fate of the Star Wars™ galaxy with these figure packs! Leia Organa has been a powerful political force in the galaxy, both as a member of the Galactic Senate and as a leader of the Rebel Alliance, where she fights to overthrow the tyranny of the Galactic Empire and restore freedom to the galaxy. With the Leia Organa Ally Pack, you can bring this Rebel diplomat to the front lines of combat. 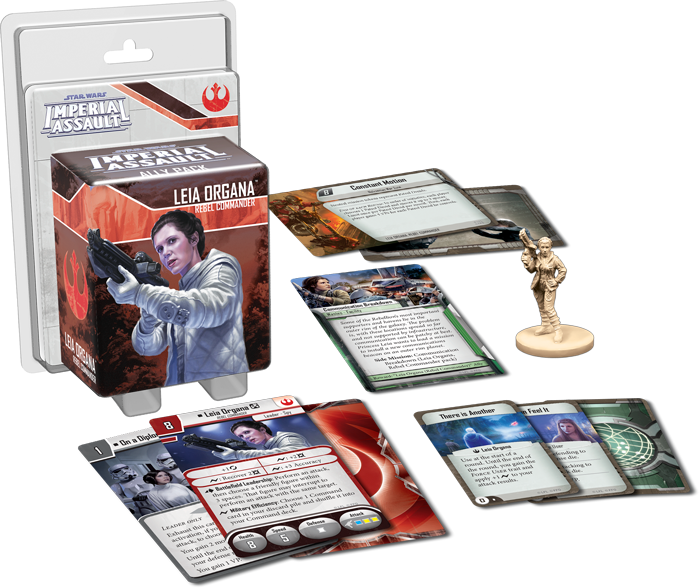 In your campaigns, the Rebel heroes can help Leia Organa expand the Rebellion’s web of contacts and allies. In a new side mission, you’ll install a vital communication beacon on a far-flung planet with Leia’s help, but you can be sure the Empire’s forces are ready to oppose your efforts. As she joins your soldiers on the battlefield, Leia’s natural leadership can help her allies make concerted attacks against the enemy. Leia Organa is no less dangerous in your skirmish games. A new skirmish upgrade card from this Ally Pack lets you send a Leader character on a diplomatic mission, forgoing combat in favor of peace. 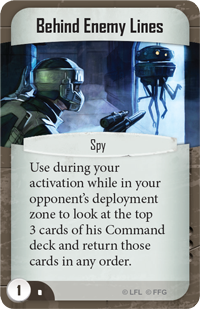 Two new skirmish missions force you to successfully navigate a Nelvaanian War Zone, while the Behind Enemy Lines Command card gives you vital knowledge about your opponent’s tricks and lets you determine which Command cards he receives next. Whether working as a diplomat or a fighter, Leia Organa can lead the Rebel forces in any battle. Rebel Troopers fight across the galaxy, but those stationed at Echo Base were specially trained to deal with the extreme environment that awaited them there. 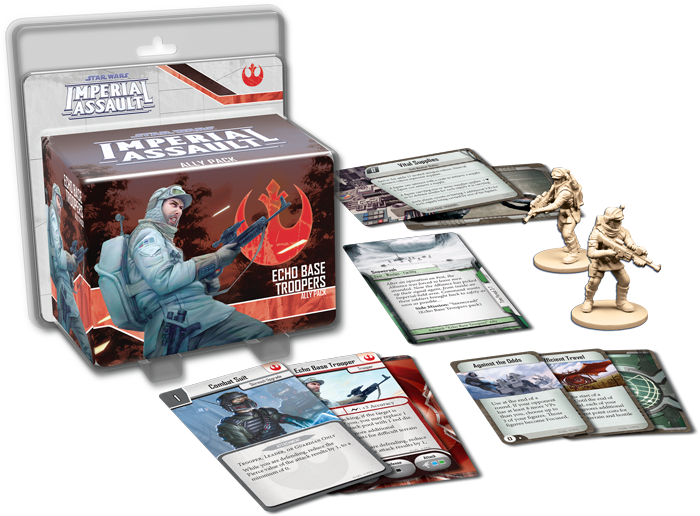 The specialized training given to Echo Base Troopers can make the difference between victory and defeat in a game of Imperial Assault and the Echo Base Troopers Ally Pack invites you to fight for the Rebellion with these heroic warriors. The Echo Base Troopers offer several advantages to the commander who employs them wisely. 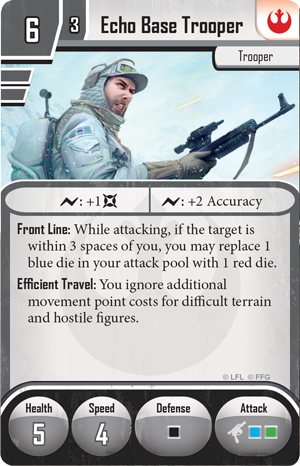 When Echo Base Troopers take their place on the front line, you can dramatically improve their firepower by swapping a blue attack die for a red attack die. In addition, Echo Base Troopers are trained to traverse the dangerous ice fields of Hoth, and their Efficient Travel ability allows them to ignore the effects of difficult terrain on the battlefield. You may have cause to call upon the Echo Base Troopers in your campaigns or skirmishes with the new missions introduced in this figure pack. A new campaign side mission forces you to escape from a collapsing Rebel base, while two new skirmish missions bring your competitive battles to a Hoth Weather Shelter. With several new Command cards to change your skirmish game tactics, this Ally Pack brings the Echo Base Troopers to the forefront of your Imperial Assault battles. As the Rebels attempt to escape from the grasp of the Empire, the Imperial leaders may turn to bounty hunters in order to track down and apprehend the missing Rebels. One of these unsavory guns-for-hire is Dengar – a bounty hunter renowned for his brutality. You can hire this hunter with the Dengar Villain Pack and inflict a host of punishment on your foes. When you field Dengar among your warriors in the campaign game or the skirmish game, his powerful abilities ensure that you’ll inflict Harmful Conditions like Bleeding, Stunned, or Weakened on your opponents. A new three-card Agenda set, Punishing Tactics, invites you to use Dengar to conceal the location of a kidnapped Rebel operative even as you prey on the weakest heroes in every campaign mission. This ruthless killer also fights for the highest bidder in the skirmish game, even as two new skirmish missions send you into a Hoth Battle Station to set explosives or carry out an inside job. Three new Command cards add to the punishing potential behind every attack, and you may even take a gamble and play Dangerous Bargains to grant three victory points to both you and your opponent. If you can score points faster, Dangerous Bargains helps you rush to victory, but if you must be cautious or your opponent may outpace you. 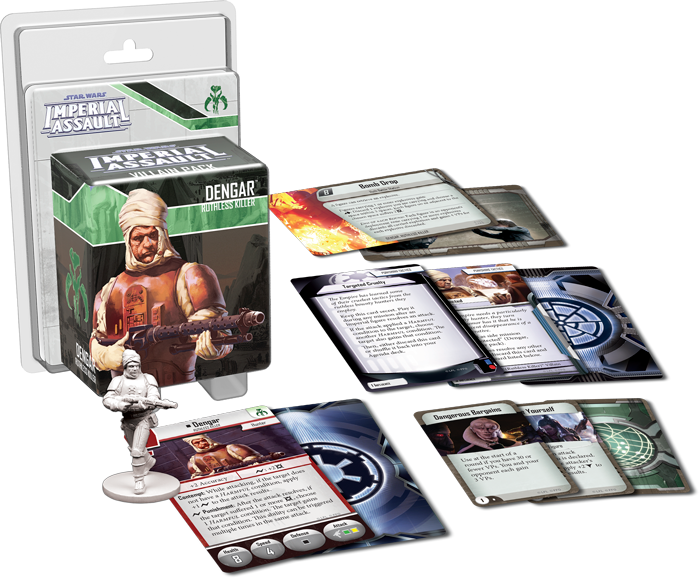 In both the campaigns and skirmishes of Imperial Assault, Dengar can be a valuable asset for the Galactic Empire and the Mercenaries of the galaxy. The final Villain Pack in these expansions focuses on General Sorin, one of the Empire’s foremost military minds. General Sorin leads by example on the battlefield, coordinating attacks and inspiring his own troops to benefit from his abilities. In your games of Imperial Assault, General Sorin is an excellent centerpiece to enhance the potential of every figure in your forces. During a campaign, General Sorin comes with a three-card Agenda set that plays to General Sorin’s favored weapons – heavy vehicles and an explosive arsenal. 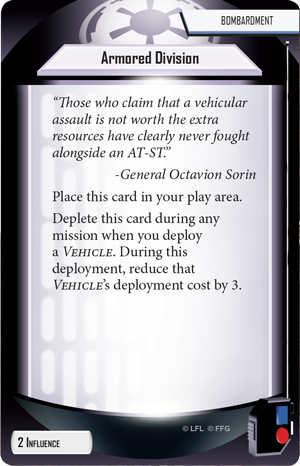 You might play the Armored Division Agenda card to quickly lower the cost of any Vehicle unit, allowing you to bring it into play for a significantly lower cost. Alternatively, you could challenge the heroes to face down a division of AT-STs on Ando Prime with this set’s Agenda mission. Whether you use the Bombardment Agenda set or not, General Sorin is a worthy nemesis for the campaign included in the Return to Hoth expansion. You may also harness General Sorin’s natural leadership in the Imperial Assault skirmish game. Two new skirmish missions bring you to a Climate Research Camp, where you’ll fight on a variety of different terrain types set in close proximity to each other. 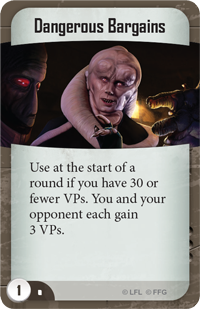 Finally, three new Command cards expand the field tactics of the Galactic Empire, meaning that the General Sorin Villain Pack is an excellent addition to any Imperial strike team in the skirmish game. 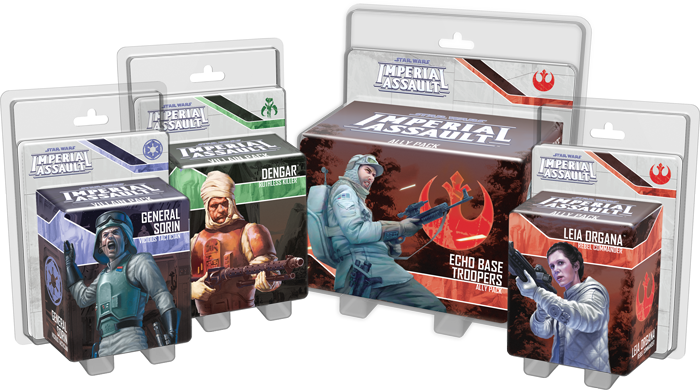 Four new Ally Packs and Villain Packs join the ranks of Imperial Assault figure packs with the Return to Hoth expansion. You may engage in aggressive negotiations with Leia Organa, lead from the front with General Sorin, hold the line with the Echo Base Troopers, or punish your foes with Dengar, but no matter which figure packs you choose, each brings new tactics and new adventures to your games of Imperial Assault.